The village of Ratkovo is situated on the north-eastern side of Turcianska hollow and on the right bank of River Vah. 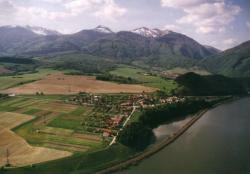 It is surrounded by two significant mountains - Mala Fatra and Velka Fatra. The village spreads on 108 hectares and is one of the smallest one in the region. The first reference about the village dates from the middle of 13th century and the earliest written reference dates from 1489 when the village was owned by the family of Revay. The first village land owner was Matej of Ratkovo who got the village from King Matej Korvin as a present for his success in battles. The village consisted of only 3 houses in 1620 and those were destroyed by flood and the families were forced to move onto the hill called Hradisko which is situated close to the village. They built new wooden houses and in 1715 the village had already doubled in size and number of households and towards the end of 14th century 14 houses existed here and 88 people lived in Ratkovo village. Inhabitants made their living out of farming, agriculture, fishing and river transport. The Village Council and village symbol were established in the 18th century. The symbol features king’s crown on a hill and cross. The village flag consists of three colours - yellow, red and white. FOOTPATHS in the area: Sutovsky waterfall is situated 2 hours from Ratkovo and hill of Cheb is about 3 hours away from Ratkovo. Village ATTRACTIONS: Ratkovo is located very close to Krpelianska dam where fishermen can enjoy their hobby; public footpath leads to Kopa or Sip hill and the village is also close to the international route number I.18 from Zilina to Tatry. Ratkovo is very small village which does not have that many private businesses.